Book Adventures: YA Wednesday: The Fairy Godmother Dilemma, Interview, & GIVEAWAY! YA Wednesday: The Fairy Godmother Dilemma, Interview, & GIVEAWAY! I just can't get enough of these covers (the other two are further down)! Aren't they beautiful? LDS, YA author Danyelle Leafty sure knows how to design a great image --AND a great story. 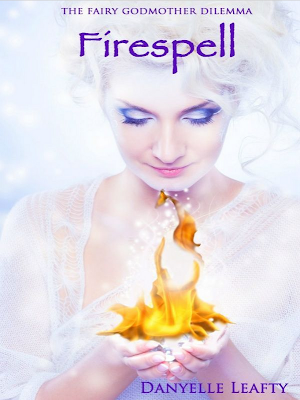 Danyelle is the author of The Fairy Godmother Dilemma series which currently includes Catspell, Firespell, and Applespell (see below), loosely based on the classic tales The White Cat, Swan Lake, and Snow White & Rose Red respectively. Danyelle's writing is fresh and clear and her characters are easy to imagine. She has done a great job at crafting believable personalities and a rich setting. Sixteen-year-old Breena never thought anything could be worse than being forced to leave the faerie realm. Then she got stuck with a fairy godmother. But if she has to choose between the two, she’d leave the Faerie Realm over getting bossed about by a faerie with a pointed stick any day. Unfortunately, her attempt to evade her fairy godmother gives her growing pains in the form of fur, whiskers, and a tail. Turning into a cat is the least of her worries, though. The potion wasn’t meant to bring out her inner feline, it was meant to put her to sleep. Forever. If Breena wants to make it to her Happily Ever After, she’ll have to accept that sometimes a fairy godmother really does come in handy, after all. Unfortunately, Danyelle's health has not been too great recently. In light of this, her awesome husband, Lake, has been doing all he can to support Danyelle and her books, including doing interviews on several blogs. He is championing her cause to put a smile on her face. Isn't he the best? Below are the interview questions Lake was kind enough to answer for me. I hope you enjoy! As a spouse, in what ways do you support Danyelle’s writing? Books. We buy books. When we were married and moving her in she had 500 books. My brothers and I had never seen someone with that many. We had 2000 plus two years ago. We make sure she has ample time to write. I do a lot of cooking. I take care of the kids on weekends so she can write. What advice do you have for others who may have a writer loved one? Love them. Even though they tell you that you're biased towards their writing, don't believe them. Their books are the best. What is Danyelle’s writing schedule like? Usually at bedtime and nap time. How does she balance her writing with the other aspects of her life? Depending on deadlines. When deadlines; family and writing only. When no deadlines; 2k words a day, then she's free to do other fun stuff. And how did you meet? We took an introduction to elementary education class. In which we were in the same group. She was the leader and I was the lowly group member. She decided to keep me. Did writing or books have anything to do with it? Now it's all about books. Our six year old gets frustrated if we miss the turns that would end us at Barnes and Noble. What do you think about Danyelle’s affinity for collecting dragons, talking frogs, and fairy godmothers? Its a nice signature, and takes up extra lines when she texts me. Where does she keep them all? They all live in her head. Can I plead the fifth? No, I enjoy just about anything as long as its not too wordy. Which I really don't know how to explain. I'd have to say my favorite authors are Dan Wells, Larry Correia, David Farland. She typically reads mg/ya fantasy. I tend to like adult fantasy of nowadays novels. FIVE and a half. Frogspell and Trollspell will hopefully be released before the end of the year. So if you get an eReader for Christmas, there's five books you can already upload. Plus I just found out there will be a collection of short stories that take place during the fairy godmother's time as a wicked fairy (Applespell). 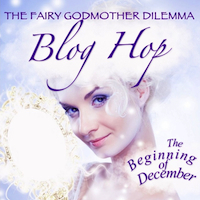 How did Danyelle design the beautiful covers for The Fairy Godmother Dilemma books? She was very lucky to find some great stock art and tutorials on YouTube, is her take. My take is, She is a very talented Lady. Does Danyelle have any other amazing stories in the works? If so, could you give us a teaser or two? Yes ma'am. The Bitten series is about slightly vampiric fairies. The Feathered Serpent series is about what happens when magic bites. Do you know if Danyelle will continue to self-publish eBooks and do novel subscriptions or might she have a go at a traditional publishing route in the future? She is looking at diversifying her publication process through trade publishing, small press and self publishing. Anything else people should know about the fantastic Danyelle Leafty? She is very fantastic, loving, artistic. She has a love of studying languages. She likes to make me laugh. When Alora’s Prince Charming is chosen due to political expediency, she tries to put her best foot forward. But thanks to a magical mishap, her feet are webbed and her body resembles that of an overgrown goose. Her brother creates a charm that enables her to look human from moonrise until moonset, so she sets out hoping she can convince the prince she is a girl, rather than the main course. Alora soon learns that she isn’t the only one with secrets after she stumbles upon an ancient plot that would warp the threads of magic holding the land together. When her plan to foil the plot ends up with her Prince-Charming-to-be walking into a trap, Alora finds herself caught between an age old grudge and the most powerful creature in the world: the Firebird. What she needs is a fairy godmother. What she gets is a frog. When the faerie queen is unable to revive Mara, Nerissa decides that she's done with fairy godmothering, finished with being a winged problem solver, and no longer willing to deal with the heartbreak that comes from wishes, wings, and wands. But now, rather than mopping up messes and helping them achieve their perfect Happily Every After, she must stand in the way of the DIDs and their Prince Charmings. 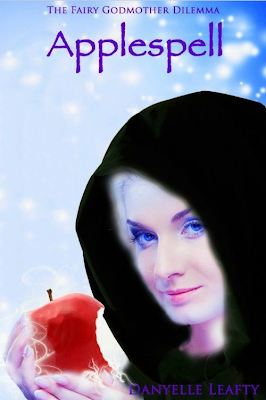 A good wicked faerie never rests until she uncovers an Unhappily Ever After, and Nerissa is nothing, if not dedicated. She has already chosen her new DIDs--a girl named Snow White, and her sister Rose Red. As the tale unfolds, Nerissa soon learns that being a wicked faerie isn't all that different from being a fairy godmother. It's all in the application--and where the heart lies. 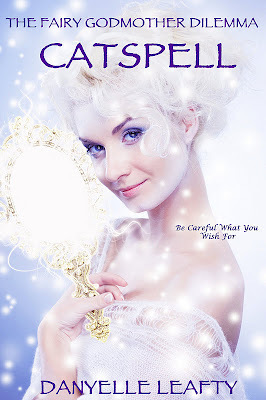 One lucky commenter will win The Fairy Godmother Dilemma, Book 1: Catspell eBook! Ends Dec. 16th @ 11:59 PM MST. Check out these other blogs featuring Danyelle and her books! Notes From the Writing Chair - Giveaway! Diana's Amazing Book Adventures - Giveaway! Christine Fonseca, Author - Giveaway! Roots in Myth - Giveaway! An Author Incognito & Janette Rallison's Blog - Giveaway! I love Beauty and the Beast!! This cover is beautiful! I think my favorite fairy tale would have to be Cinderella. Another book for my list!! Thanks Diana! Thanks Diane. I'd like to thank each and everyone of you for your support. Hopefully you'll be able to enjoy The Fairy Godmother Dilemma more than me. I'm loving it, but haven't finished because this is my iPad but my kids claim it. To thank y'all for your support for every five honest reviews posted to amazon we will be giving away a gift card to a place of your choice with in reason and our budget. You pick the place, I pick the amount. We will give you until the twenty first of December. Once again thanks for hosting me blogger and thanks for all your support readers. I also wanted to say I love book adventures. Ps. This was so fun. If anyone is ever interested in hosting me let me know. So I have found a new love of Snow White recently and can't wait to dive into these books!